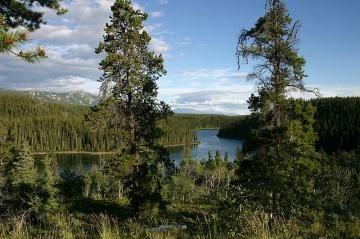 Long Lake is a popular year round recreation destination located near the community of Whitehorse, Yukon Territory, Canada. It is also a place of history for the local First Nation people. The Livingston Winter Road traveled pass Long Lake during the early 1900s. It was a 109 kilometre route used by the Ta'an Kwach'an First Nation people and local miners to travel between Lake Laberge, M'Clintock River and the mining town of Livingstone. Today, the lake is a popular destination for summer outdoor activities like hiking, swimming, canoeing, fishing and mountain biking. The backcountry gravel roads leading to the lake plus the wagon roads in the area make for good snowmobile and cross country ski routes during the winter months. When the temperatures drop and the lake freezes over ice fishing is enjoyed on the lake. There are two Long Lake recreation trails used heavily by hikers and mountain bikers. One trail circles the lake while another leads from the community of Whitehorse to the lake. The loop trail circling Long lake is 2. 5 kilometres long and the trail leading from the community to the lake is a 4 kilometre one way route. The trailhead to the longer route is located east of the community of Whitehorse, right after the Yukon River Bridge, near the corner of Lewes Boulevard and Alsek Road. The route navigates rolling hills, travels through forests of aspen and spruce trees and climbs along rocky ridges. The trail follows along the same sight lines as Long Lake Road and the Yukon River. The longer one-way trail begins by climbing Crocus Hill. Once on top of the hill, the trail continues along a ridge. There are many side trails in the area. It is important not to get tempted and thrown off track following another trail. Always stay on the ridge at all times and do not follow any of the gravel roads which intersect the trail. Cross all the roads. When you reach a gravel road with views of a small lake the trail narrows and becomes a single track trail. The narrow trail climbs to a final ridge before dropping into a valley where you will see Long lake. The longer trail hooks up with the loop trail on the east side of Long Lake. The loop trail circling the lake starts where Long Lake Road meets Long Lake. The trailhead is located on the west side of the lake. From here the trail follows the shores of the lake exploring through low lying brush and an aspen forest. Along the trail are some beach access trails which are great for private moments and shoreline fishing. However the history of stocking the lake for fishing has been challenging as the nutrients in the lake are low. Stocking the lake started with trout but the food source disappeared and the trout died off. In 1998 they tried again restocking the lake with Kokanee Salmon. But that was a short lived pipe dream too. So in 2005 they introduced Bull Trout to the lake. How to Get Here: Travel to the community of Whitehorse on the Alaska Highway in the Yukon Territory, Canada. Near the SS Klondike cross the bridge over the Yukon River and travel on Lewes Boulevard. Continue on Lewes and then take a left onto Alsek Road. The longer trail begins at the corner of Lewes and Alsek Roads. To start your adventure at the lake do not turn onto Alsek Road. But instead.. when you are crossing the bridge over the Yukon River and traveling on Lewes Boulevard turn left onto Wickstrom Road. Wickstrom turns into Long Lake Road which will take you to the lake. It is about a 4-5 kilometre drive from town. Good signage pointing to lake on roads.